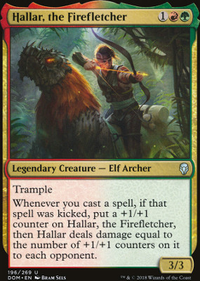 -I haven't had a chance to test yet without Dragonlord Kolaghan , but I did play 2-3x games where I ended up not even casting her b/c I already had either/both Rhythm of the Wild and/or Temur Ascendancy in play, as the latter especially is a prime tutor target. I felt like with increased consistency in terms of landing specific enchantment pieces that grant haste, I wanted a utility dragon vs another haste enabler. -I've never not been impressed with Urza's Incubator . Worst case it is incredibly helpful in ramping into casting the commander, and it can discount some/most dragons down to 2-3CMC. 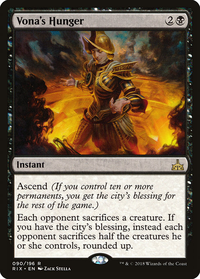 With an ETB draw engine like Temur Ascendancy in play, this can lead to some very busted turns/sequencing. 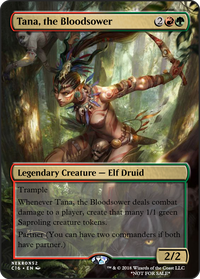 With Goreclaw, Terror of Qal Sisma out, suddenly our commander costs only WUBRG, which is flippin' sweet. -Where my mana splits/curve landed, it is now primarily a Gruul deck with a secondary Black Splash and tertiary Blue and White splashes. 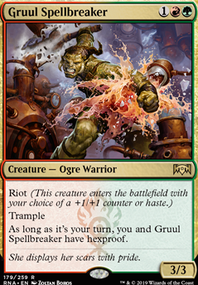 As such, a primary fetch target is usually Stomping Ground or Sheltered Thicket , meaning that the other RG duals all then come into play untapped. It is actually harder to guarantee that Cinder Glade will meet its ETB untapped condition than Rootbound Crag in this build/with most lines and with which opening hands you'd want to keep. -Incidental scry and 5c color fixing from Path of Ancestry has always felt worth it to me, but if anything I could see that slot going back to Exotic Orchard or Forbidden Orchard if I'm ever in a situation where it feels like I'm stumbling. So far, I have been able to find turns for situational ETB tap lands that haven't led to taking a turn off or going off curve, as usually we're going 1 into 3; 2 or 3 into 4 or 5; or 4 or 5 into 7 or 8, so there is an opportunity to deal with limited ETB tapped lands by turns 4-5. - Urborg, Tomb of Yawgmoth is strictly there to have fetchlands tap for mana if need be/if shut off by effects that prevent their use. It also gives global black fixing so black doesn't have to be prioritized and helps later with double-black requirements in some of our higher curve spells like Patriarch's Bidding and Crux of Fate . It also unlocks our two conditional/creature lands to tap for black ( Cavern of Souls and Haven of the Spirit Dragon . This also helps de-prioritize swamps as a target for fetches/land ramp spells. 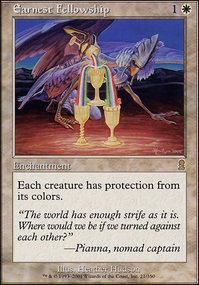 Basically a lot of upsides to situations/problems that are only fully resolved by Chromatic Lantern , but for the "free" cost of a land slot. I haven't been disappointed by it so far. I may try your land suite and see how it feels; why are you running 1x Forest and 1x Snow-covered Forest vs 2x Snow-covered Forests, however? Hmm, I'd like to hear from you how this version performs since I don't want to cut Dragonlord Kolaghan . Also what are your thoughts after playing with Urza's Incubator ? Is this kind of ramp we need? For land fetching - you have 6 forests and only 2 cards that look specifically for those so I guess that skillful play will fix any problem that would occur. In my build I have both forest duals from BFZ and additional Forest besides 4 forest shocklands and 1 Snow-Covered Forest just in case and to buff a little my chances of having source in opening hand to play dorks. Lately I'm thinking about cutting lands that ETB tapped so Path of Ancestry might get cut despite being 5-color land and in my opinion you don't need Urborg, Tomb of Yawgmoth for fixing since you aren't going for Cabal Coffers combo or casting intense spells. 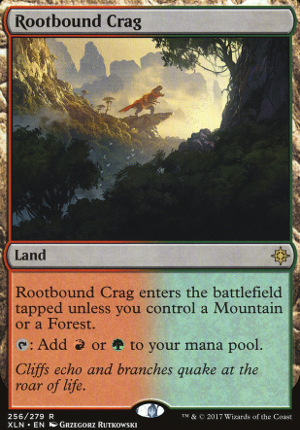 On a side note, if you have Rootbound Crag and i.e. Watery Grave then you're forced one turn behind when we discussed how early turns actually get us ahead and allow to keep up with stronger decks. Taiga might be an option but for now I have similar concern regaring overall deck price so Spire Garden or Cinder Glade might be an option. Hey, looks good, but one of the best interactions with Animar are cards that can bounce themselves or other creatures you control. This lets you get more counters on Animar faster. Statue can bounce itself unlimited number of times since its colorless, each time you bounce it you put a counter a on Animar and it reduces the casting cost of Statue. Low mana cost creatures who give you value when they ETB are good when you can bounce creatures. Cloud of Faeries : untap lands. Pollenbright Druid : new from WAR, +1/+1 counter or proliferate. Fierce Empath : tutor for big creatures. Eternal Witness : recur any card from graveyard. Reclamation Sage : destroy any one artifact or enchantment. Farhaven Elf or Solemn Simulacrum : basic land ramp. When playing a lot of creatures as well as bounce then Beast Whisperer is good repeatable draw. Forgotten Ancient and Managorger Hydra are two good cards for the +1/+1 counters strategy because each gets counters when any player plays a spell. This includes your opponents and in multiplayer Commander these creatures can get very big. They're also good with the strategy of bounce because you're casting creatures after you bounce them back to your hand. 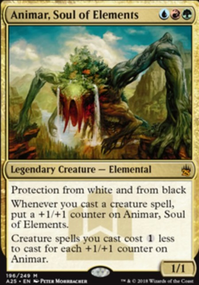 Ancient can be a counters engine since at your upkeep you can move counters from him onto any other creatures you control any way you like including onto Animar. If you like some of these suggestions I offer help to make cuts. I see it, very cool!! Maybe add 4x Stomping Ground , x2 Rootbound Crag , 1x Pelakka Wurm , 1x Ghalta, Primal Hunger . If budget isn't an issue, Collected Company would be better than Harmonize except that it wouldn't get you Rhythm of the Wild . If, however, you do add Tarmogoyf , Commune with the Gods might be the best. Price doesn't equate to synergy. Other lands worth considering: Copperline Gorge , Rootbound Crag . Birds of Paradise is strictly better than Llanowar Elves .